Amazing Amp with Bluetooth is exactly what you need and nothing you don't. The perfect PA is finally here for an amazing price. Amazing Amp BT is the next generation of Amazing Amp/Happie Amp. Happie Amp didn't name it amazing, the customers did. BT connection so you can use your phone or tablet wirelessly. Individual volume controls for each wireless channel. The ability to turn off each wireless channel when not in use to prevent interference. THREE rechargeable 9V batteries INCLUDED! Rechargeable 9V battery charger built in! 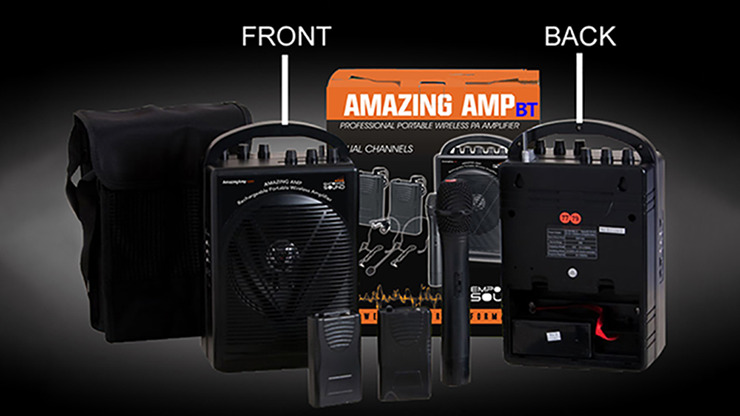 Amazing Amp is the #1 Portable PA System for entertainers, public speakers, and wedding officiants. NEW- Positionable antenna makes it near impossible to break the antenna. ALL-INCLUSIVE! You could open the box at your event and use it! 2 wireless channels! 2 people can be mic'd at the same time OR you can ACTUALLY plug another device (MP3 player, projector, boom box, CD player, etc.) into the second transmitter (included) and THAT UNIT IS NOW WIRELESS TOO! Highest quality long lasting (5+ hours) internal rechargeable battery. Small enough to carry under your arm and loud enough for up to 400 people! Built in receiver. No more packing up 5 different components. Amazing Amp is ALL INCLUSIVE!